As one of the stars of Cashmere Mafia, Lucy Liu has a glamorous reputation to uphold. So it's little surprise to hear she loves the Valentino Couture tote bag. Her gold metallic variety adds a little glitz to any outfit. If you're not comfortable toting such a bold metallic bag, don't worry. The Couture is also available in classic black or white, as well as feminine pink and purple. All couture bags are made from only the highest quality leather. 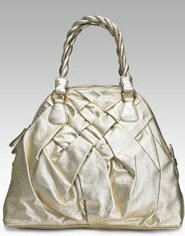 The bag's top has a stunning woven detail, which falls into soft pleats at the purse's base. The effect is dazzling and utterly feminine. The interior is simply designed, but so effective. You'll appreciate the handy zippered pocket, and the generous storage space. A top zip keeps all your bits and pieces safely and securely inside. The braided handles are made with comfort and durability in mind. You'll never have to worry about a snapped strap with this clever design.